Gates and Guyton: Is Microsoft Word the New Masolino da Panicale, Inventor of Perspective? The Banquet of Herod, in which di Panicale invents perspective. Handsome as a movie star, Wade Guyton hails from Tennessee, can’t draw and had trouble getting NYC art fellowships. Got his start in NYC as a security guard at Dia. Now his computer generated “paintings”, which he designs using images he scans from books designed by other graphics artists, get a prestigious “mid career” retrospective at the Whitney. 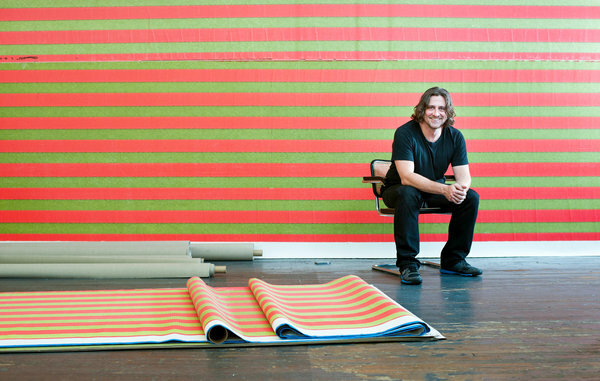 Wade Guyton, by Karsten Moran for the New York Times. This is the one graf in the whole story which makes me stop screaming ART SCHOOL CONFIDENTIAL. By Daniel Clowes, from his comic book Eightball. and for losing the battle for software and hardware to Steve Jobs while quashing innovation, surviving disgraceful anti-trust suits, and ripping off competitors. Unaesthetic doesn’t begin to describe Guyton’s medium. Recent stories about Gates’ anti-innovation business model underline the point.